For some clients of a Fresno wedding photographer, those memories are missing because she didn't show up at all, or deliver what they paid for. FRESNO, Calif. (KFSN) -- For many couples, their wedding is a once in a lifetime event that can't be repeated or replicated. All they have left to remember their big day are the pictures. 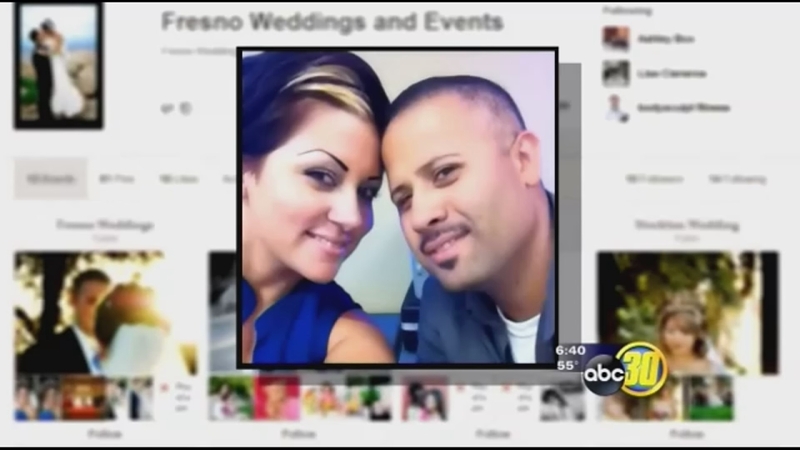 But for some clients of a Fresno wedding photographer, those memories are missing because she didn't show up at all, or deliver what they paid for. Recently, we met one couple whose wedding photos consist of what their guests took on disposable cameras, and a few that their professional photographer posted as a preview. Hallie and Mike Frisby's July 2012 wedding day was a blur. So the Clovis couple was looking forward to remembering their big day with their professional wedding photos. Except, they have yet to receive them. "We really want our priceless wedding memories," Hallie said. "These are memories we can never ever have back. We have family members. That she's taken pictures, that only she has." The Frisby's hired this woman, Desiree Genera, owner of MC Studio Photography and Dazaray's Bridal to take pictures at their wedding. According to the contract they paid $1,425.00 for 5 hours of coverage, a CD with copyrights of the images, multiple prints, engagement session and an album. Desiree delivered their engagement photos, and Mike and Hallie loved them. But a week before their wedding date, Hallie got an e-mail, that the studio moved from this Clovis location to Seaside. And Desiree was taking a leave of absence until further notice. The Frisby's say Mike or Miguel Cisneros, Desiree's husband, showed up to shoot their wedding. But after the deadline for guaranteed delivery of their photos came and went. The Frisby's took both to small claims court, asking for their money back and their photos. "We've done no breach of contract whatsoever," Mike said. "We waited the amount of time, we tried contacting her afterward to figure out where the photos were and she decided she didn't want to give them to us." ABC30 tried to speak to Miguel Cisneros outside the court hearing, Miguel and Desiree both declined an on camera interview. But Desiree told us via e-mail. "I was very ill with hyperemesis, doctor took me off of work completely as I spent 13 day out of each month in the hospital with severe vomiting and dehydration." "I never completed the job as contracted. My job requires editing and due to my illness I have not been able to do so. Therefore my contract states she is to be refunded." She added, "Hallie is not workable. She is verbally abusive towards me and that is not tolerated. Since then I no longer do photography." To date, five former photography clients, including Hallie Frisby, have filed small claims cases in Fresno County court against Miguel Cisneros or Desiree Genera. One has been paid in full, two were dismissed, and two are pending. One of those pending was filed by Carmen Medina. She signed a $2,400.00 contract with Dazaray's Bridal for photography, DJ services and a photobooth at her upcoming June 2013 wedding. She made monthly payments but grew concerned when she couldn't get a hold of Desiree. "Sure enough I looked on her website, it was no longer available, I called her phone number, it was disconnected," Carmen said. "I thought huh, something's wrong. Sent an e-mail it was undeliverable." Desiree claims Carmen then canceled her contract but Carmen says she never did. She turned to the Better Business Bureau, but says Desiree declined mediation. The BBB review shows Dazarys Bridal with a C- rating and three customer complaints. "She's got 10% of the inquiries and 25% of the complaints, you kinda wonder if you've got a rogue out there," Blair Looney said. "And somebody's not delivering." Desiree says she is the victim of what she calls "Bridezillas." She showed us the temporary restraining order she filed last September against one of her former clients, who she says was harassing her. And several of Desiree's clients e-mailed Action News with positive reviews. Roxann Zamora wrote: "I am a past, present, and future client of Dazaray's... Dazaray is a very sweet and hard working woman she goes out of her way to help with whatever you need to make your event run smooth." But both Carmen and the Frisby's say that couldn't be more different from their experiences with Desiree. Carmen said, "It's not right you get to take people's money and not do anything for it and call yourself a victim." In the video below, we have some tips from the experts on how to avoid a wedding day disaster.